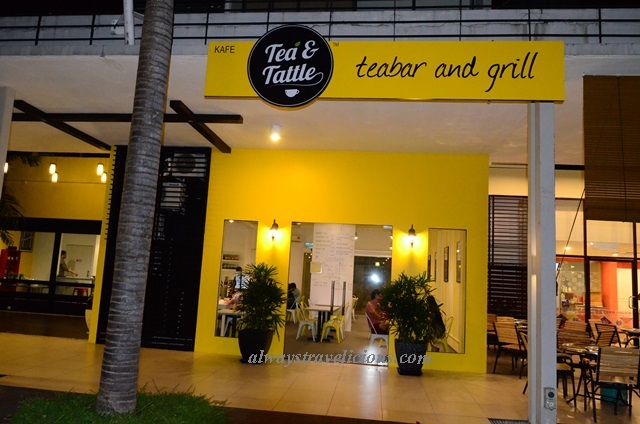 Tea & Tattle @ Ipoh (De Garden) - Always Travelicious ! Drinking tea at Tea & Tattle is truly a sophisticated experience – where teas come with a dainty sand timer that indicates how much time you must endure before you can take in a sip of warmth. Tea is the main focus here, served in an uncluttered environment. My chocolate cherry black tea (RM 10.80) has a hint of cherry and an intoxicating scent of chocolate – an amazing thing where tea actually smells like chocolate without tasting like it. A moderate tanning is felt after refilling the water for a few times. While I liked it, Gary was not a big fan as it reminded him of cough syrup – one man’s meat is another man’s poison. The Guayusa Tea (Rm 10.80) is full of herbs that reminisce both the scent and flavor of the Chinese herbal tea “pak chu cao” most commonly found in traditional kopitiams, but a lighter version. 7 minutes of waiting time is required for this one. The pot is all fancy and it pours itself effortlessly once you rest it on top of the cup. The Gumbo Stew (RM 25.80) consist of chicken, sausage and prawn. I didn’t really know how gumbo is supposed to taste like but as “stew” is concerned, I was expecting a heavy gravy but it’s more of a soup with a refreshing vegetable base where flavors of celery, thyme and sweetness of onion are apparent. Chicken chop (RM 29.80) is succulent with a crisp skin, accompanied with a bunch of side dishes – coleslaw, chips, corn and vegetable salad. French fries are a bit dry though. We had two puddings – strawberry and chocolate (obviously) (RM 12.80 each). No surprises with the pudding part but it was the cookie base that I liked the most. The base is a compelling solid crumble (I like that oxymoron by the way!) – where it is packed solid and impossibly hard to dig through; yet once you have digged your way through, the the sand-like, fluffy crumbles are rewarding. Tea & Tattle’s yellow theme’s interior with its tea-inspired posters. Tea & Tattle’s menu include breakfast selections, meals of substantial portions for the hungry ones and also light snacks such as chicken wings, sandwiches and nachos. I’m quite a traditonalist when it comes to tea and had a chocolate tea once at the QVB in Sydney but didn’t it. Give me a classic Tikuanyin or Pu-erh any day. I like the idea of fancy dressed-up teas, but the reality of this fusion of foods/ fruits in a tea is not something I enjoy. The cafe is lovely and lemony and I agree, any dessert with a biscuit base makes my day. Yes, I am ever ready to try new cosmetics and skincare but am strangely a purist with tea. Can’t explain my commitment to tradition here but fancy teas seem to mess with my palate.